With this button you can delete all information about the current synchronization state. No files will be deleted, Easy2Sync will simply ’forget’ what the contents of the directories last looked like and only work one the data currently visible. A file is 'changed' if it does match with the memory of Easy2Sync in neither of the two directories. This happens when you synchronize for the very first time and the files are different or if the same file was changed in both directories. There are several possibilities how Easy2Sync can act. The alternatives explain themselves and influence if Easy2Sync should suggest a copying direction and which direction this will be. If the copying is done directly or after a request is not influence by this choice, but only by the options. Please note that the first and the last choice may not be able to suggest a copying direction. In this case, Easy2Sync always shows a request. This can be a problem if you can to synchronize without supervision. 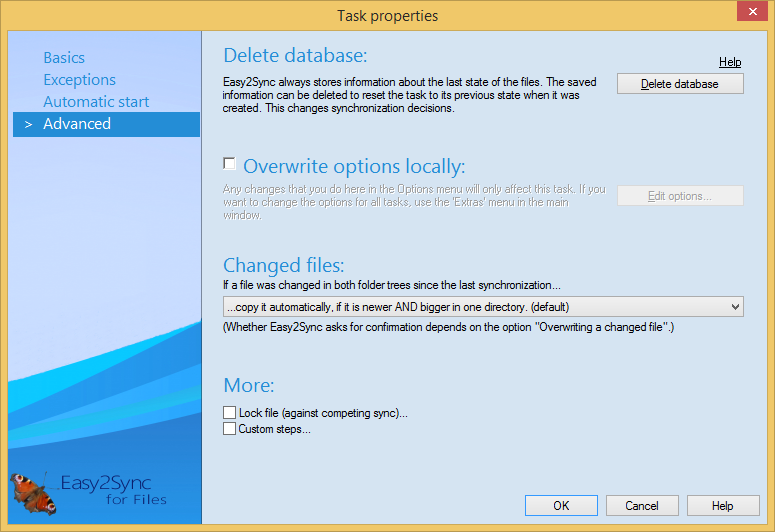 If you've installed Easy2Sync on multiple computers you can use this feature to prevent the multiple Easy2Syncs to sync the same folder at the same time. Allows you to run your own Windows batch commands before/after the sync.